Discussion in 'Discussion (AdGuard for Windows)' started by streetwolf, Apr 10, 2014. Is there any need to use Firefox add-ons like Ghostery, Do-Not-Track, etc. when using AG? No sense being redundant. I'm surprise there hasn't been a response to my question. Surely it must be known if these the of add-ons I mentioned are needed with AG. The forum didn't notify me of this topic, so I didn't see it until now, sorry about that. I personally don't see why there would be issue running Ghostery and Do-Not-Track with Adguard. While yes, there *may* be incompatibilities I have to think that chance seems pretty small. They probably would work very well with the Spyware filter. He's not asking if there are incompatibility issues but rather if adguard can replaces them, so does it block trackers. @Street i did not reply because personally i do not know. Exactly. Does AG block the same trackers as Ghostery for example. Why use both if AG blocks all the same trackers. 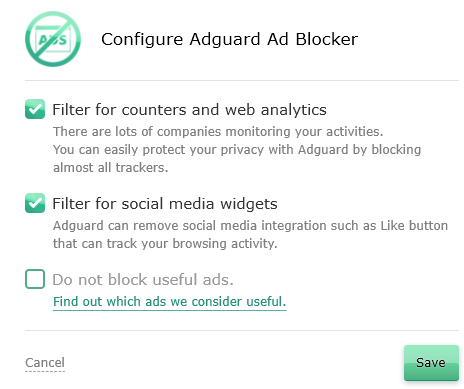 Seems adguard does block trackers but how good it is i dont know testing would need to be done and even then i dont know how you would do that testing, you could also add the EasyPrivacy list from here https://easylist.adblockplus.org/en/ but i dont know if its already included or woul make much difference. How would you apply the EasyPrivacy list to AG? Any filters you have added yourself or via the adguard helper will be wiped! if you want to keep them, export them and add them to the end of the list you downloaded using notepad before importing. Thanks Nameless. I found out the hard way that my filters were wiped out. Now I know what to do. No problem, and that's why i added the warning as ive done it a few times myself now, hopefully this is getting changed in the next update. Don't know if this is a problem, but iframes aren't currently blocked in AG. So trackers are still loaded in many sites that uses iframes. For this reason, I only use AG on a test machine and not my main pc. Until avantar or another dev see's it though there currently isn't a fix for iframes though im sure it be sorted soon. Is it appropriate, advised or necessary to continue using 3rd party addons for filtering if obvious candidates for blocking are not blocked by default ? I think that there's no need to use other filtering programs. Our databases are alike and all popular trackers are blocked by our trackers filter. what do you mean google-analytics is untouched? do you activated spyware filters? He meant that spyware filter is disabled by default. While it would be nice as the default, it being by default disabled is probably as intended. Users might freak out if certain things don't work that they use, e.g. Google Analytics and encountering false positives with breaking websites becomes more a possibility. Exactly. It was enabled by default in the past, but we've decided that users know better what they need. User sees a detailed wizard on the first program startup so it's no problem to set up filtering as he want.